I never thought I’d become a fan of land snails. As I’ve said before, I started my PhD with the quaint idea that you could study a group of organisms for years and still regard them as little bags of genes with no particular importance beyond their ability to help you answer questions. Perhaps that’s true for some people and some animals, but not me and snails. I’m now a card-carrying member of the land snail fan club, and take every opportunity to remind people of the amazing lives these creatures lead. But, as is so often the case, the more you learn about snail shells the more beautiful they become. I’m not much of a mathematician. To be honest I find a lot of maths to be a horribly complex, and seemingly arbitrary, and I could never really follow it past basic algebra. Still, every now and again I’m struck by the beauty of a system that can explain parts of reality with such ease (and by envy for those who can see so much deeper than me). 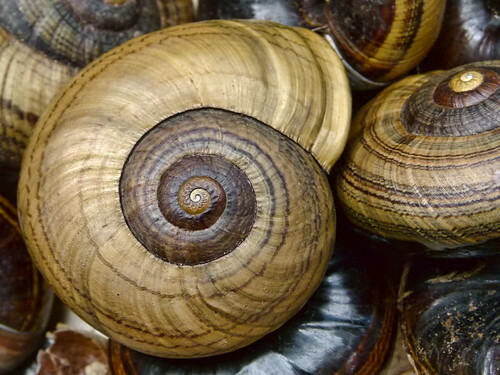 The mathematical description of snail shells is one of those cases in which the maths is easy enough for me to understand, and so I can appreciate the elegance. 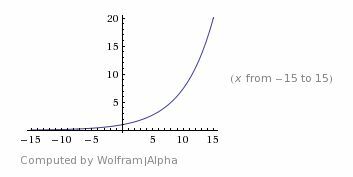 The exponential function can tell us how big a shell gets, but of course, shells don’t simply grow, they also spiral at the same time. 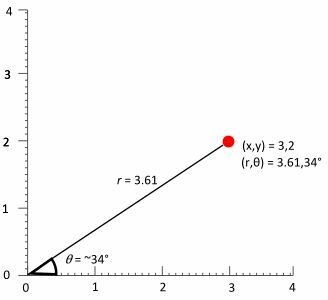 If we want to model both the growth and the spiral pattern of a snail’s shell we need to leave our familiar “x,y” system of placing points (called the Cartesian coordinate system) and think in “polar coordinates”. I know that shape, that’s a Wainuia shell! With a little bit of tweaking you can make a paua (k = -0.6) or something close to a tightly-turning charopid (k = -0.1). 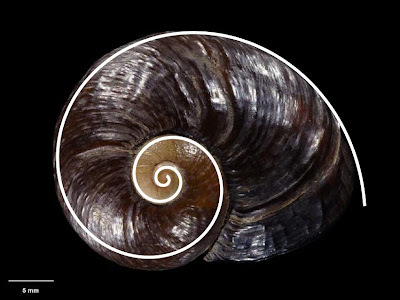 Just changing one parameter in a pretty simple equation is enough to produce spirals that fit most snails’ shells. In fact, spirals like these ones, which are called logarithmic spirals, pop up in nature all the time – from the arms of galaxies to the nerves in your eyes. 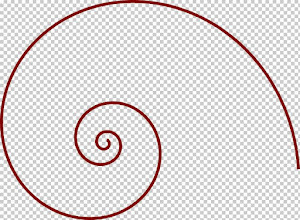 Logarithmic spirals have some pretty cool properties, the most interesting of which is that not matter how large they grow they ever change shape. A snail that grows according to these equation will be the same shape from the day it’s born to the day that it dies. If you know a bit more maths you can extend these models into a third dimension and, with one more parameter, create flat disc-like shells or tall conical ones. 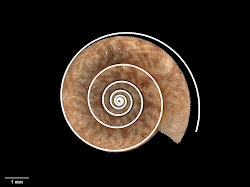 I think it’s truly amazing that you can get a good approximation of snail shells using so few parameters – but it’s worth remembering mathmatical constructs are just models we use to examine reality. David M. Raup got a bit carried away with the mathematical description of shells in the 1960s, and created what he called the “museum of all shells” by exploring the three dimensional shapes you could make by tweaking just three parameters in a model of shell-growth. But Raup’s virtual musuem doesn’t include all the shells that snails can grow. Biology is weird, and any “law” that a biologist might claim to have discovered will have an exception. None of the shells above quite fit the spiral I’ve super-imposed on them, and some snails grow shells that radically deviate from logarithmic growth . 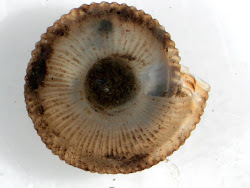 My favourite example of such a radical departure are the “worm snails“, marine snails that cement the apex of their shell to a rock then grow an almost un-coiled tube of a shell. 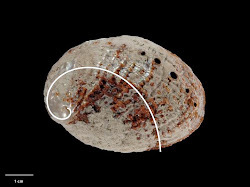 Worm snails grow in way that is radically different from most of their close relatives, but more subtle deviations from logarthmic spiralling are just as interesting. Remember these guys? 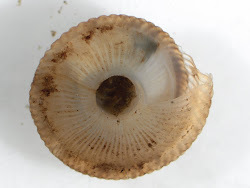 Of course, the original “wide” umbilicus is still part of the older shells. 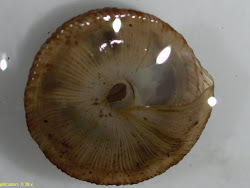 In effect, this pattern of growth creates a cavity within the shell which has lots of space at the top, but a very narrow opening. Amazingly, L. fratercula is a marsupial snail. Over the course of its growth this species creates a pouch within its shell, which it then lays its eggs in, protecting them from would-be predators who can’t get inside the narrow opening. 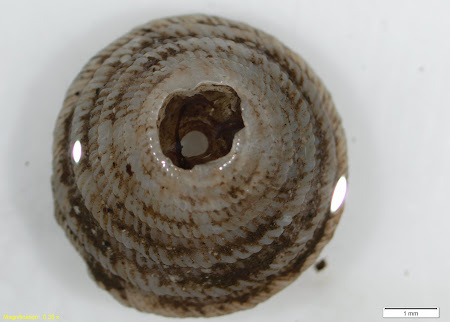 Most of the larger shells from this species show this sort of damage. When you zoom in on the damage you can see a slighltly irregular pattern. These holes are creatued by immature snails emmerging within the brood pouch and eating their way out of their parent’s shell. 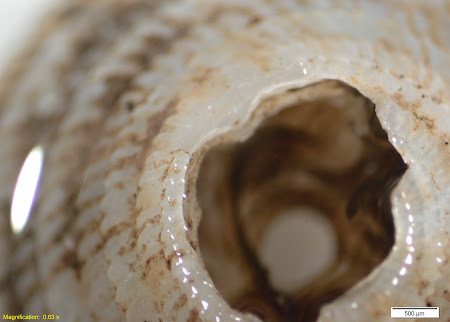 Such damage doesn’t seem to kill the snails – they effectively wall-off the first few whorls of the shell once they are large enough, so there is no animal within the part of the shell that is broken. I can tell you a lot more about these snails. Allen Solem described the “brood pouch” and a little of their ecology in 1968, but he worked from old shells and no one has studied their behaviour in situ to be able to measure the impact of this strange adjustment to snail-life has on parents. The shell photographs onto which I’ve super-imposed the sprials are all Creative Commons Licensed courtesy of Te Papa 1,2,3.